Our Round Thistle Pewter Flask 6 Ounces measures 4.33 inches tall by 3.54 inches wide. This handsome 6 ounce pewter hip flask, is the perfect gift for a whisky lover or for a loved one who is proud of their Scottish Heritage. Adorned with an intricate Scottish thistle border design the circular style flask gives off a real aura of the country North of the border, as well as being beautiful in its own right. This hip flask is composed of the highest quality, lead free pewter which will not tarnish over time, and makes it an ideal commemorative gift to remember a landmark birthday or special occasion. 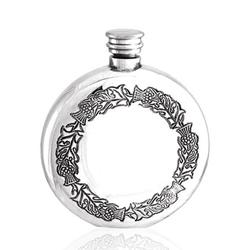 The highly polished finish and plain space in the center of the thistle border makes this flask ideal for engraving with the recipient's name or a personal message. Supplied in an elegant cream and black presentation box this stylish hip flask is sure to be well received by your loved one on any occasion.